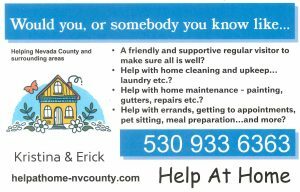 Help at Home provides services to anyone who needs it at their home! This can range anywhere from running errands, house cleaning, pet-sitting, painting, gutter cleaning, to yardwork. Ultimately, let us know what you need and we'll do it! Senior living at it's best. Independent cottages, assisted studio, one and two bedroom apartments, and memory care unit. Transportation, 24 hour staffing, plus three meals daily. Assisted living and Alzheimers Residence. Helping Hands is a community non-profit since 2008. Nevada County's only adult daycare program. 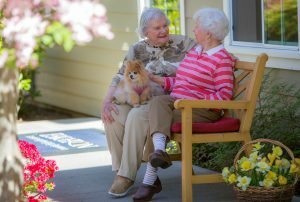 A caregiver respite program reaching out to Nevada County caregivers and families with seniors who need respite from family members and friends who require assistance during the day.